Most of the abundant knapped Palaeolithic assemblage, which is found throughout all layers of Cueva Negra, consists of small chert, limestone and quartzite artifacts: denticulate or notched pieces, slug-like (“limaces”) pieces, pointed pieces, beaked pieces (“becs”), and scrapers with abrupt steep (“Mousteroid”) edge-retouch. Some are less than 3 cm long and nearly all are less than 6 cm. 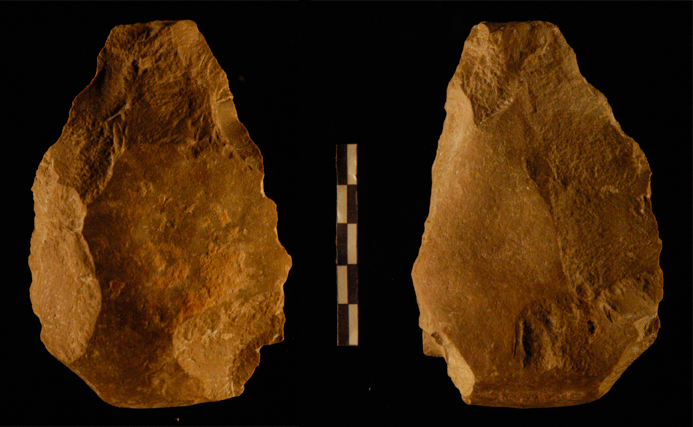 Many are on chert fragments but some on flakes with striking platforms and bulbs of percussion. Most of the chert came from a nearby conglomerate outcrop (0.8 km E of Cueva Negra) containing chert cobbles that had eroded out of Jurassic limestone cliffs during the Upper Miocene (Tortonian). Jurassic strata contain subrectangular blocks (sometimes 30 cm long, weighing 5 kg) of tabular chert which erosion reduces and often turns into rounded cobbles (10-15 cm across). All the local chert tends to break up into fragments when struck, and only occasionally gives well-formed flakes with striking platforms and bulbs of percussion. Nevertheless, several such flakes indeed were removed by repetitive centripetal flaking of small discoidal (“Levallois”) cores. Trace-element analysis at Arizona University of “rare earth” (lanthanide) elements implies that sometimes chert was brought from 25 km away. We have excavated both hammer-stones and possible cervid antler knapping billets. An enormous number of waste flakes and spalls testifies to knapping in the cave.